We divided the networks into two types: Local Area Network (LAN) and Wide Area Network (WAN). The two networks are generally classified on the basis of their coverage area. Typically, a local area network exists in a house or a university campus, while a wide area network exists over many office buildings separated by a vast distance. The office buildings in a WAN may be in different countries or even continents. For example, the headquarters may be in USA, the regional office may be in the UK, and the branch office may be in India. The workers in these three buildings use a Wide Area Network to collaborate with each other. The Internet can also be considered as a WAN, with the Ethernet being a classic example of WAN. In a LAN, computers and hardware such as printers can be connected by cable (copper wiring), fibre optic cabling (glass fibres) or using a wireless (radio waves) connection. 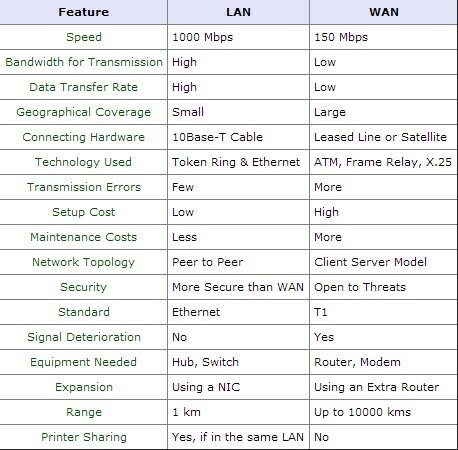 LAN and WAN play different roles in the networks. But what are their main functions and differences? Here let us check the main points of LAN and WAN. Hardware such as printers can be shared so individual workstations do not need their own printer. When they print, the data is stored in a queue on a server. The data is then passed to the printer. All the users work can be stored in a central place (the dedicated file server) so a user can access their work through any computer on the network. Software can be shared; software packages are stored on the server and downloaded to workstations as requested. Note that a license still has to be bought for each copy of the software needed. Data can be shared because database files stored in the server are available to users around the network; data from CD-ROMs can also be shared across the network. Central back-up can take place automatically at regular intervals. A user will usually be able to retrieve work that has been deleted by mistake. It is possible to set up a local intranet such as that on the KLB school network. The web pages of information can be accessed only over the LAN. An intranet is free because it does not involve phone links. There is control over users’ access rights to programs and data. As data is shared there is a greater need for security. Users of the network have to have authentication techniques such as user ids and passwords. Unique user ID’s control access to the files and settings on the network while passwords prevent unauthorized users from logging onto the network. Data may also have to be encrypted so that it is meaningless if intercepted. The cost of installing the equipment is greater. Cabling can be expensive to buy and to install. Damage to cables can isolate computers. Some sections of the network can become isolated and will not be able to communicate with the rest of the network. We know that a Wide Area Network is not confined to one building. The computers and terminals forming part of the network can be spread around the world. External communication links such as satellites, microwaves, and telecommunication links and optical fibre will be used to connect the parts of a WAN. The connection must normally be paid for because the links are external. The Internet is a worldwide WAN and a LAN can be connected to it using a router. These are similar to those of LAN’s except the scale of sharing etc. becomes far greater and can be world-wide. Again these are similar to those of LAN’s except that issues such as security become even more important as potential hackers could break into a computer system from anywhere in the world rather than having to physically be in a building. Encryption of secure data such as financial transactions is necessary because it is even easier to intercept data. An arrangement of two or more computers that are linked electronically so that they can communicate, share processing power and/or storage facilities. A network may include a dedicated file server, but does not have to. State one advantage and one disadvantage of a WAN. Advantages and disadvantages of WANs are the same as for LANs, but on a larger scale. WANs can share information around the world. The connection must normally be paid for because the links are external. Security is of particular importance. When using a LAN, why is it necessary to have a password? A password stops unauthorized users from logging onto the network or accessing another users files. Describe the software that makes up a network. A network is controlled by network software. This may be part of the operating system, or it can be designed specifically to manage the network. Describe the devices that make up a typical network. Cables and connectors are required to link hardware devices together, and network cards are built into computers used as terminals in a network. Other typical hardware devices that may form part of a standard network are: One or more computers acting as dedicated file servers or print servers, scanners and printers.